In part one of my eco-friendly back-to-school series, I showed you the stylish, child- and earth-friendly backpacks and lunch bags that my children will be taking to school next week. Today, I have some more cool, eco-friendly options to share with you. I am excited about these products because they all come from innovative companies that truly care for our earth. They offer amazing school supplies and waste-free lunch products. If you love great stationery and lunch containers like I do, you must explore these extraordinary options. Read on to win some goodies of your own too! First up is this fun kit from TreeSmart. It kind of makes me want to go back to school. My kids are fighting over this one, so I might just have to keep it myself. TreeSmart's company philosophy is based on the belief that we are all responsible for our environment and must promote the wise use of our global natural resources. 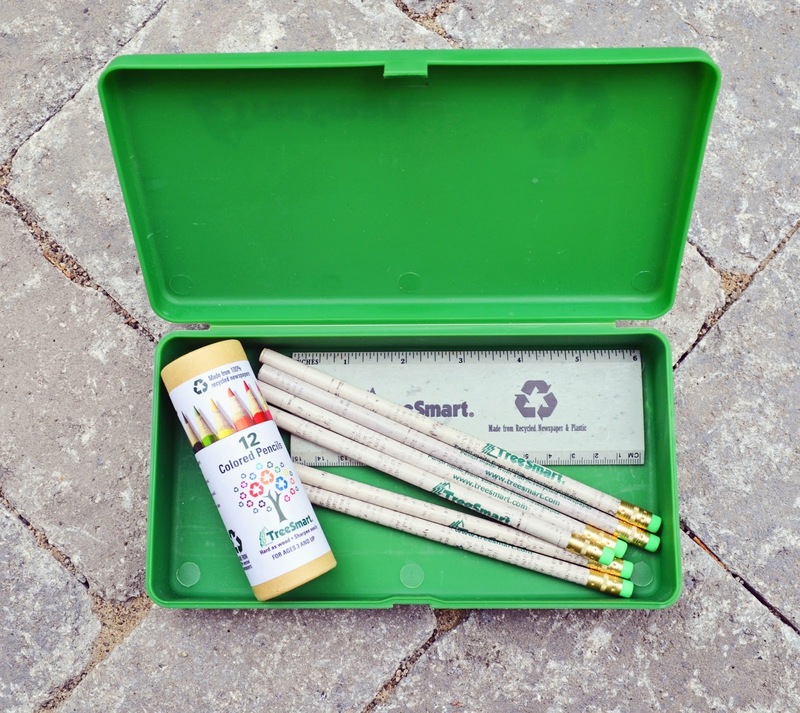 Since 1998, TreeSmart, located in Lake Oswego, Oregon, has been making pencils from recycled newspapers. They wrap whole newspaper sheets around high-quality graphite, so there's no mulching or mixing with toxic recycling chemicals. TreeSmart uses a special adhesive formula to bind the newsprint together into a cohesive core trunk that's as hard as wood. TreeSmart also makes recycled newspaper colored pencils and recycled newspaper and plastic rulers. Visit their online store to see more products. 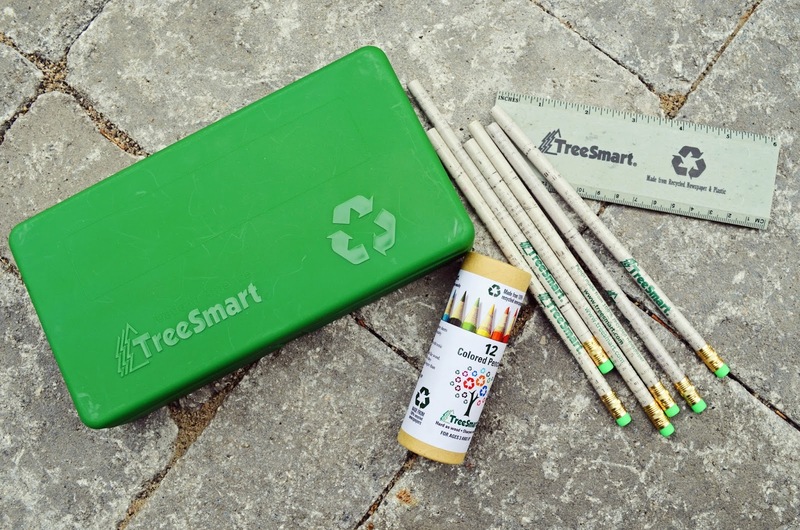 TreeSmart also offers a "Newspapers for Pencils" school fundraising and recycling program. Another great source for amazing, eco-friendly supplies, Stubby Pencil Studio is the creation of mom-of-twins Kate Rosenthal, who recognized a need for environmentally friendly, do-it-yourself stationery products for young kids. Kate sources quality creative products that are unique, non-toxic, recycled and educational. Just have a look at some of Stubby Pencil Studio's offerings, above. The pencils are made from recycled cedar wood scraps. 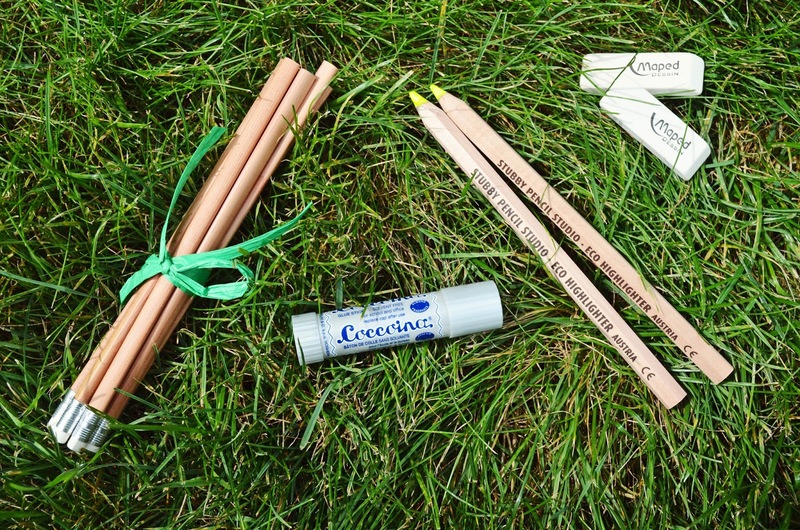 Made in Italy, Coccoina glue sticks are created with potato starch. They're gluten-free, non-toxic, non-solvent and acid-free. And they smell like almond marzipan. Yum! Perhaps my favourite item of all is Stubby Pencil Studio's eco highlighters. 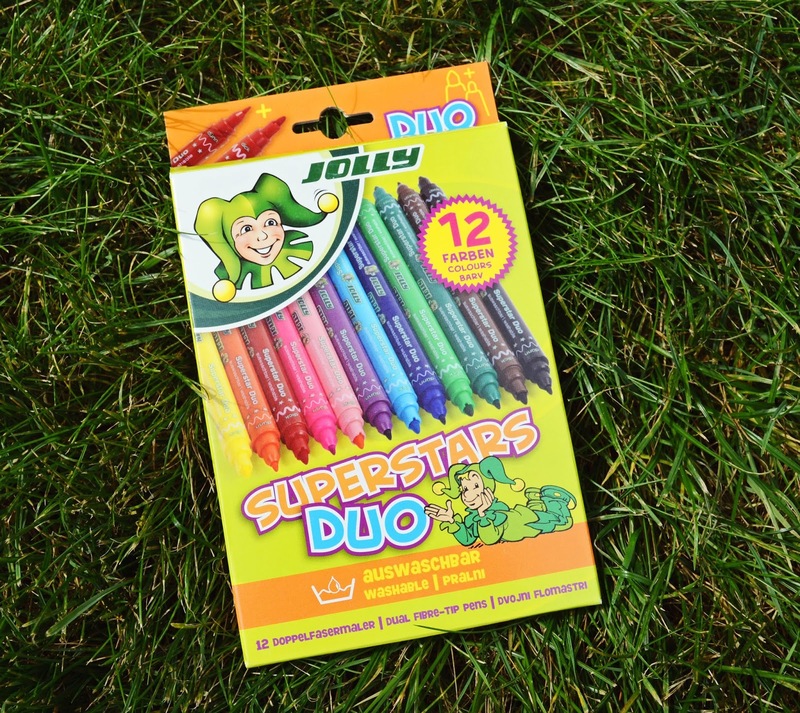 Unlike standard highlighters, these highlighters are eco-friendly - they use no plastics, ink solvents or volatile organic compounds. 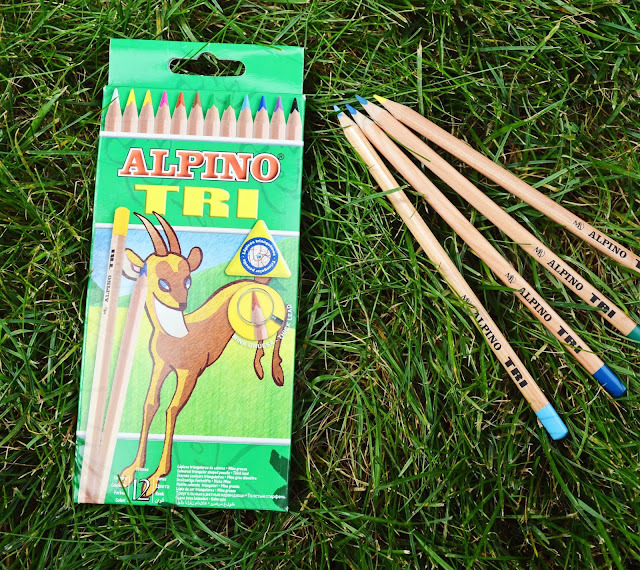 They have a natural wood finish that makes them look like pencils, so my family and I initially questioned whether they would actually work well. It turns out these highlighters glide smoothly on the page, leaving the same finished look as a conventional highlighter. But they are actually much more fun and easy to use! And they won't leave a splotch on your pants if you drop them. That's golden. I believe in having a little fun with our school and office supplies, whether we are kids or grown-ups. Also sold at Stubby Pencil Studio, I think these made-in-Germany KUM carton sharpeners are adorable. They are made from recycled materials and feature cute wildlife graphics. The beechwood tops hold double pencil sharpeners for standard and jumbo pencils. The high-carbon steel blades are sharp, long-lasting and replaceable. Kate also sells these Alpino triangular coloured pencils, which are made in Spain. The ergonomic triangular barrel shape increases finger contact with the pencil surface for improved control that helps children to learn proper hold. They are made from reforested wood. Jolly Superstars Duo felt tip pens are like two sets of markers in one. Each marker has a thick tip on one end and a fine tip on the other, making them convenient for artwork and school projects. The vivid colour inks are washable and non-toxic. Stubby Pencil Studio's prices are quite reasonable too, so you'll find that being eco-friendly doesn't have to cost an arm and a leg. If you are a fan of beautiful journals and sketchbooks (and who isn't? ), be sure to look at the captivating designs on ecojot's website. In fact, the website itself is a lovely feast for the eyes. These people clearly know design. 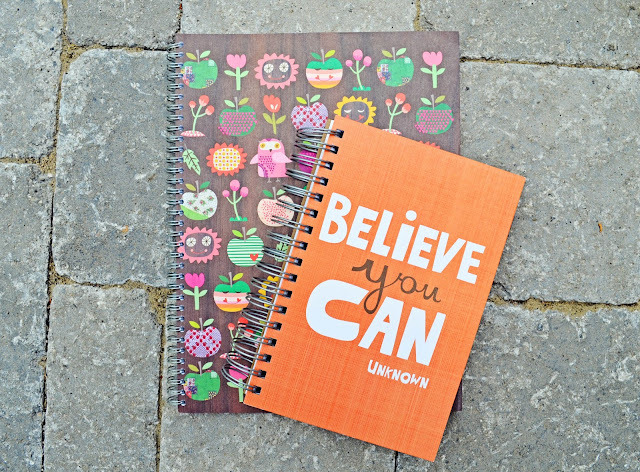 Founded by brother and sister Mark and Carolyn Gavin, ecojot creates eco-friendly stationery, paper goods and custom products featuring whimsical and inspirational designs. Ecojot is a sustainable brand of made-in-Canada products that are now available in hundreds of locations around the world. The company offers a range of recycled journals, sketchbooks, children's sketchbooks, gift wrap, calendars and note cards that make wonderful gifts and personal keepsakes. With the sale of every ecojot jumbo journal, like these beauties above, a child in need receives a workbook or pen to build their literacy skills. Ecojot's "GIVE" program was inspired by children that founder Mark Gavin visited in schools in Kenya. Children like James, a boy who had lost his father to a tribal war. Mark noticed that James erased the content of his workbook every time it was used up. He told Mark that he didn't know when he'd be able to get another workbook. Through their "GIVE" program, Ecojot has donated over 250,000 workbooks and 44,000 pens so far to children in Haiti, Kenya, Tanzania, Nigeria, Poland, Honduras, Niger, St. Lucia and Zimbabwe. Learn more by visiting ecojot on Facebook. If you live in the Toronto area, you can support ecojot's programs for children by attending their 2nd Annual GIVE concert on September 26th. In my opinion, school lunches are the worst thing about back to school. My kids are picky about what they will take, and they wouldn't dream of eating a simple sandwich. In order to make my life easier, I like to make sure I have the right sizes and quantities of food storage containers. I am thrilled with the bounty of containers I got from Preserve. Not only are these containers sturdy, bright and attractive, they are also 100% recycled and recyclable. Preserve products are made from #5 polypropylene plastic collected from individuals through their Gimme 5 program and from companies like Stonyfield Farm. The plastic is cleaned, tested, recycled and given new life as Preserve products. Choosing Preserve plastic over conventional products makes for a sizeable reduction in greenhouse gases emitted and significantly less water, energy, oil, natural gas and coal used. We can never get enough mini food containers in this house - for packing crackers, grapes, dips and sauces and all sorts of other foods. If the same holds true for your household, check out Preserve's mini food storage 6-pack. The colour of green apples, these mini containers hold 8 oz. of food. They are ideal for baby food, snacks, leftovers and yogurt. All of Preserve's containers have seal-tight, screw-top lids that won't pop off in your bag. The lids are made of the same recyclable material as the containers themselves. And they are stackable, so you have a fighting chance of keeping your cupboard tidy! They are also dishwasher-safe, because, well, who wants to wash a pile of dishes at the end of the day? 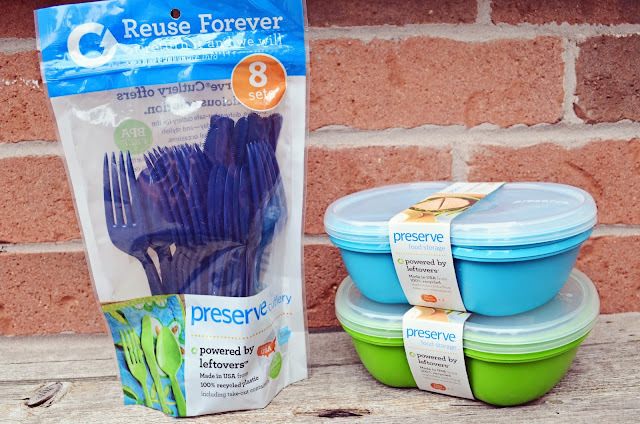 Preserve also offers recycled and recyclable cutlery, designed to be dishwasher-safe and withstand hundreds of uses. Preserve products are BPA-free and made in the USA. Preserve also makes razors and toothbrushes. In fact, founder and president Eric Hudson's first Preserve product was the toothbrush. 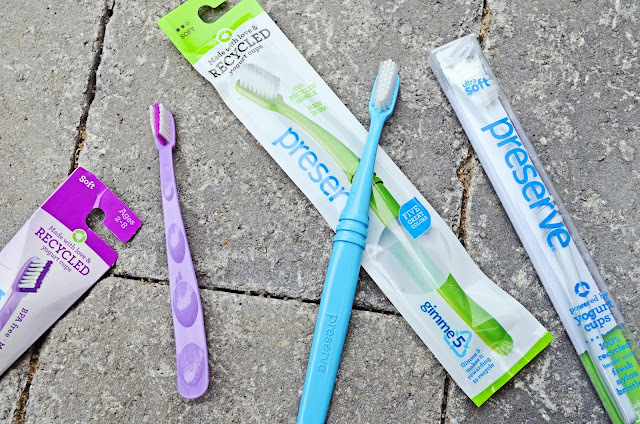 Committed to using our earth's resources more responsibly, he worked with dentists, scientists and engineers to create a high-quality toothbrush from recycled plastic. Their toothbrush subscription program allows you to receive new toothbrushes on your customized delivery schedule. When you are finished with Preserve's personal care products, you can send them back for recycling through the Gimme 5 program. 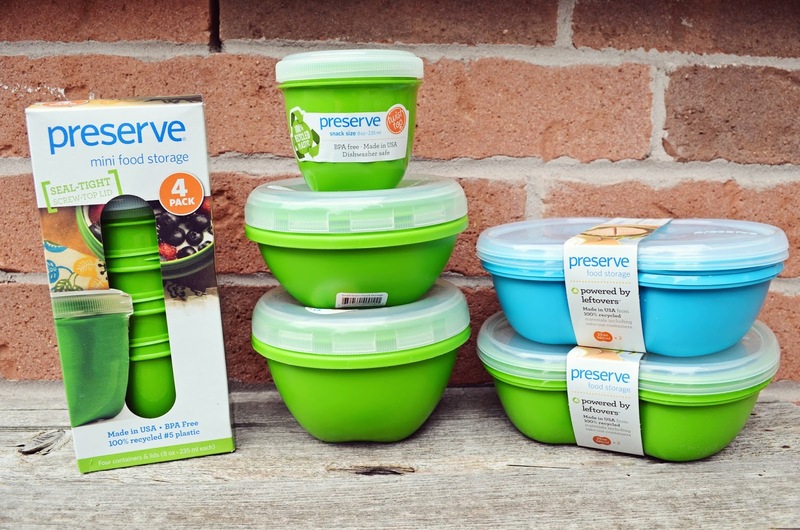 Save 25% off Preserve food storage! It's a great time to stock up on Preserve's food storage items. Until September 3rd, you save 25% by using the promo code School25. 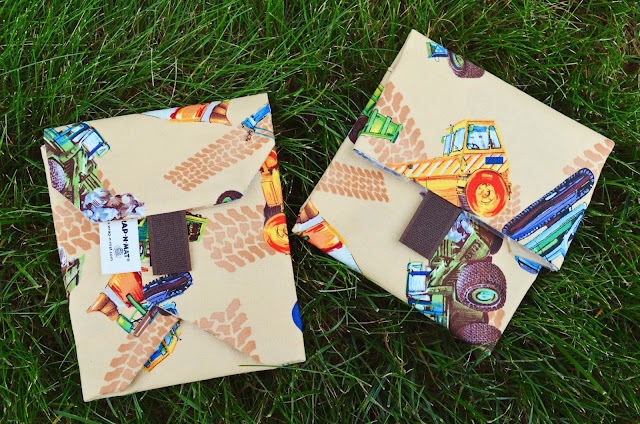 Another very cool and increasingly popular waste-free lunch option, Wrap-N-Mat reusable sandwich and snack wraps are fun for kids and adults alike. 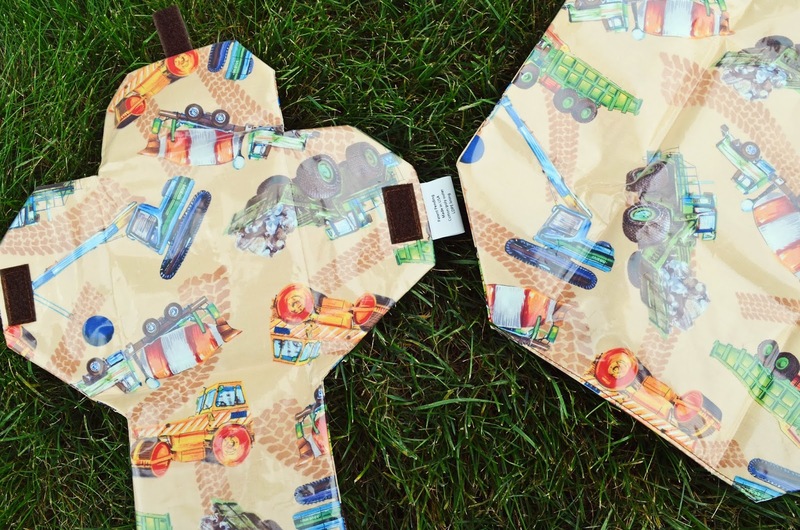 This construction trucks wrap/mini set will be enjoyed by my son. I've got my eye on the organic cotton apples wrap/mini set for myself. The genius of these wraps is that they fold nicely and securely around your food, but when it comes time to eat, they unwrap into a nice, clean placemat. I really could have used these when my kids were small! They would work well for eating in the car, at the park and, of course, on a school desk. The original wrap (above, right) is perfect for a sandwich, and unfolds into an octagon shape.The mini pouch (above, left) holds a half of a sandwich or a handful of chips or crackers. The inside is lined with food safe plastic to keep food fresh. The lining is free of lead, phthalates, BPA and PVC. Just wipe it down after each use! The wraps are also dishwasher safe. Founder and creator Bonnie Smith developed the idea for Wrap-N-Mats in 1997. With four kids under the age of six, Bonnie often packed up lunch and headed to the park. One day she ran out of plastic sandwich bags and decided to improvise, grabbing a paper towel and masking tape. An idea was born. Bonnie began cutting and sewing prototypes with different shapes, materials and linings. With over 1.4 billion sandwich bags thrown away weekly, Bonnie hopes that plastic baggies will one day become a thing of the past. Wrap-N-Mat also has a school fundraising program. I wish my kids' school would sell products like these! 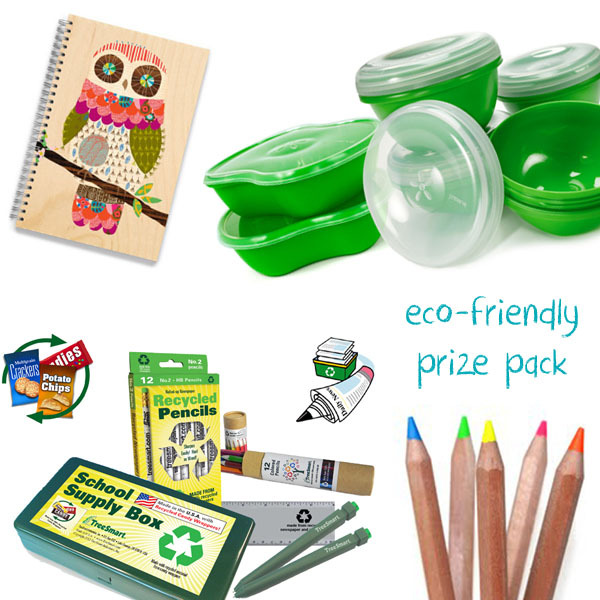 Residents of Canada and the US can enter to win one of two incredible, earth-friendly prizes. Prizes may not be exactly as shown. Please enter using the rafflecopter widget below until September 12th. I am looking forward to some peace and quiet! Shopping for supplies! New writing tools make me happy for some reason. I love the fresh notebooks! I love the new pencils and pencil box my mom would buy me for every new school year. My favorite thing is getting back into a routine. My favorite thing is/has always been back-to-school shopping. Buying new outfits, shoes, pens, pencils, books..you name it. I love it! My favorite thing was all my new school supplies. There was nothing like opening up your new box of crayons, felt pens or pencil crayons. Now it's that fall is about to begin. This is my favorite time of year. all school supplies nice and fresh, potential of learning new things, making new friends. My favorite thing about back to school was seeing all my friends again. Having sometime for ME while my granddaughter is at school. And she loves to back to school to see her friends. She also loves getting notebooks and supplies. I'm looking forward to some peace & quiet in the house! My favorite thing is hearing about my grandkids' day. My favorite thing about going back to school was learning something new,my favorite class was history. My birthday! It always comes right around back to school time. Getting new clothes was always my favourite. Getting to pick out all my folders and binders! My favorite part of school was always art class! I love crafts and still go back to some things I learned in school for my crafts that I do today! My favorite thing is we are back in routine. I like routine and the kids like routine. I like meeting new teachers, classmates, and starting fresh with a A in class. I like the start of the school year because my son will be learning something new. My favorite thing about back to school was reinventing myself every year! Hippie, sporty, preppy, etc... I was each for at least a year of HS. My favorite thigng about going back to school is seeing how excited my daughter is about starting a new year. I am excited to see my son learn new skills! no kids in the house all day! Hearing their exciting daily events. I loved back to school when I was a kid because it gave me a sense of purpose. Oh all the new stuff and fall just seems so fresh and new! My favorite thing is getting back to the routine that got totally blown all summer - my least favortite thing is seeing how sad my girl is to leave us each day! I new routine and a fresh start! Early bedtime and new routines!! I am a teacher, so my favorite thing is about the third week of school when all of the students settle in....(and settle down :) thanks! My favorite thing about going back to school was all the new clothes I would get. My fav thing about back to school was getting a teacher or a substitute teacher that actually wanted to do an amazing job. getting into a routine... its makes life easier! Brand new supplies and the crisp smell of fall! new school supplies and the smell of pencils!!! Back to school means back to routine-I love it! I am a teacher... and I think my favourite thing about back to school is a return to a predictable routine. I also love seeing the students again and hearing about their summers. Planning fall activities. I have finished school and my little one is too young. I loved all of my new school things when I was in school. Now, I miss my kids! More learning for my already squamished brain! Getting the kids excited to learn new things. I love starting to learn again! I actually like shopping for school supplies. I like that my kids are happy to be at school!